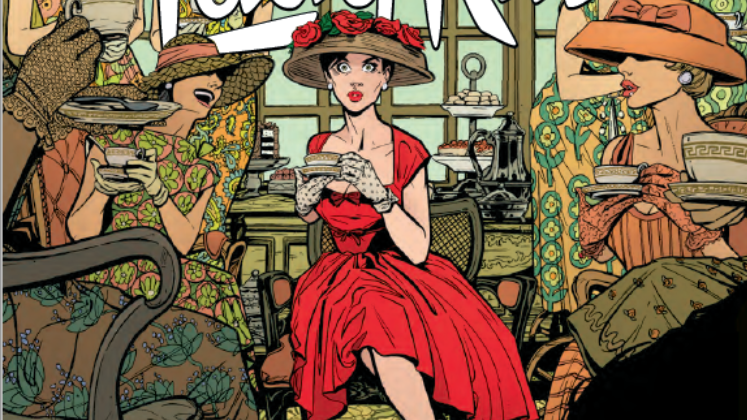 Lady Killer 2 #4 Review – AiPT! In this issue of Lady Killer 2, Josie’s new partnership begins to sour when an over-the-top gift brings trouble for Gene. Is it good? Picking straight up from the end of the last issue, Josie is furious when she realized that Irving has killed Gene’s boss and tries to sever their partnership–literally. She lets Irving live, but the consequences of both their actions continue to play out. Gene is called into his former boss’s office for questioning by the police about the disappearance, and Irving shows up at Josie’s next assignment to plead his case, making more of a mess for her. He lets her know with a bang that he’s not going to leave easily or painlessly. Jones and team are expanding their horizons in this issue, giving us a little view into Gene’s world outside of his relationship with Josie, and putting Josie into a different kind of dangerous situation than she has faced before. I think it’s a smart move to let us get to know Gene more, see the guy that Josie obviously loves even if that love is complicated. It’s still not clear what he does exactly for a living, but the industry he’s in has to be a deliberate choice–I bet we are going to see Josie getting tied in with possibly some Cold War spying/assassinations if we get to Lady Killer 3. Also, who doesn’t love imagery from the Space Race? Such an iconic part of the 60s. Irving is such a great villain–his characterization getting more and more sinister, culminating with that final act of violence that’s the lowest of the low, has been fascinating to watch. I also think it’s interesting how this may be what finally brings Josie and her mother-in-law to team up. I also loved the sequence with the burlesque dancer–it managed to be funny and violent and gorgeous all at once. Madsen’s colors make the scene explode with vibrancy. Knowing how much Jones is able to plot within each issue, I know the final two are building to something truly fantastic and, of course, blood-soaked. I can’t wait.